Reid K. Weisbord, an expert in wills, trusts, and estates has published a textbook for law students. Reid Kress Weisbord is the Vice Dean, Professor of Law, and Judge Norma L. Shapiro Scholar at Rutgers Law School. A nationally recognized expert on wills, trusts, and estates, he is also known for research on a broad range of legal topics including intellectual property, publicity rights, defamation, and criminal procedure. Known among Rutgers students for pedagogical innovation, presentation clarity, and an approachable teaching style, Weisbord has taught nearly 1,000 students in wealth transfer law elective coursework since joining the faculty in 2010. Drawing on this vast experience, Weisbord recently published a new first edition textbook titled “Wills, Trusts and Estates: The Essentials,” with two leading authorities in the field, Professor David Horton from the U.C. Davis School of Law and Professor Stephen K. Urice from the University of Miami School of Law. Rutgers Business School Professor Jay Soled also contributed a chapter on federal transfer taxation. Published in January 2018 by Wolters Kluwer under the Aspen Casebook Series imprint, this text implements the authors’ shared vision for a sleek and slender treatment of Trusts & Estates law in an engaging, accessible, and authoritative format. 1) Who is this book for? Students were the true inspiration for this textbook, which endeavors to innovate delivery of the law school survey course on Trusts & Estates. In my experience teaching the course at Rutgers for eight years, I find that students benefit more from the rigorous practice of applying legal rules than from the traditional Socratic approach that relies primarily on analysis of judicial opinions to understand substantive black letter law. To this end, we begin our coverage of each legal doctrine by explaining the black letter law in plain English rather than by excerpting a case or law review article. Having laid this foundation, we then build upon the black letter law by emphasizing the application of legal doctrine through an innovative presentation of case law and extensive problem sets simulating hypothetical client matters that practitioners might encounter in practice. 2) What's unique about this new textbook? This first edition text is innovative in several ways. First, we have redefined the role of cases in the context of a legal textbook. Unlike required first-year courses such as Property and Torts, Trusts & Estates is an upper class elective taken by students who have already mastered the basic ability to read and analyze judicial opinions. Thus, in Essentials, we include well-edited judicial opinions for the purpose of illustrating application of law rather than to facilitate discussion of whether a court reached the right decision. Having already summarized the black letter law, we need not rely on judicial opinions to set forth the basic elements of legal doctrine. To prompt active learning and thoughtful class preparation, we then complement each case with a series of questions and narrative answers that analyze the preceding judicial opinion, a format that allows students to achieve mastery of the material before entering the classroom. This Q & A format replaces the traditional battery of explanatory notes and citations to authority that, from our experience, students often do not read. Second, Essentials emphasizes problem-solving skills by providing elaborate problem sets that allow students to apply newly learned legal doctrine in realistic scenarios, mostly based on litigated cases. Many of the problem sets are as detail-rich as the cases, which facilitates in-depth classroom discussion of doctrinal nuance. A third innovative feature of our book is our visual presentation of facts in a format uniquely customized for a Trusts & Estates course. Most judicial opinions and problem sets are accompanied by family tree diagrams in the textbook, which allows students to quickly grasp the facts of each case by visualizing the relevant family relationships before reading the case. And fourth, we have taken great care to ensure that students find our book readable, engaging, and approachable. For example, to illustrate an intersection of the technical doctrine of “antilapse,” how bequests are distributed when a closely related beneficiary dies before the testator, and the default rule on survivorship, requiring beneficiaries to survive the decedent by 120 hours to inherit, we include a short problem accompanied by photographs of actresses Carrie Fisher and Debbie Reynolds. In December 2016, Fisher died after suffering a heart attack and her mother, Reynolds, died one day later, thereby raising technical questions about how the two doctrines would apply to both estates. 3) How did you get involved in this project? 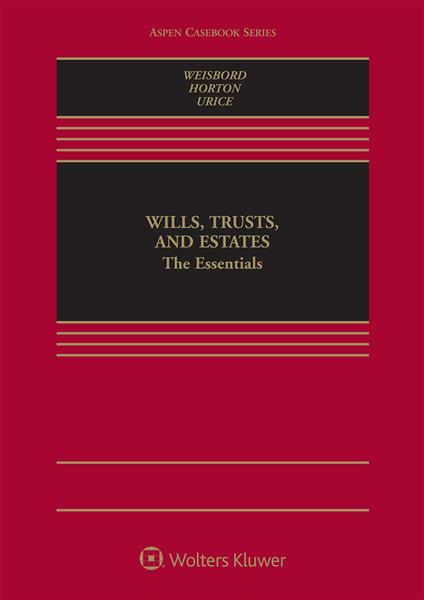 Wills, Trusts and Estates: The Essentials is the product of a wonderful collaboration with my fantastic co-authors, David Horton of UC-Davis and Stephen Urice of the University of Miami. Professors Horton and Urice are eminent scholars and well-recognized authorities in this topical area. Rutgers Business School Professor Jay Soled, another eminent authority in the field, contributed a chapter on federal transfer taxation. It’s been a true pleasure to work with my co-authors, whose expertise and experience contributed greatly to the book. 4) Where can students/professors get this book? Wills, Trusts, and Estates: The Essentials is available from our publisher, Wolters Kluwer, under the Aspen Casebook Series Imprint. The course website provides detailed information about the book and links to a companion site with extensive teaching materials, including a 300+ page teacher's manual and hundreds of PowerPoint slides, for professors using the book.